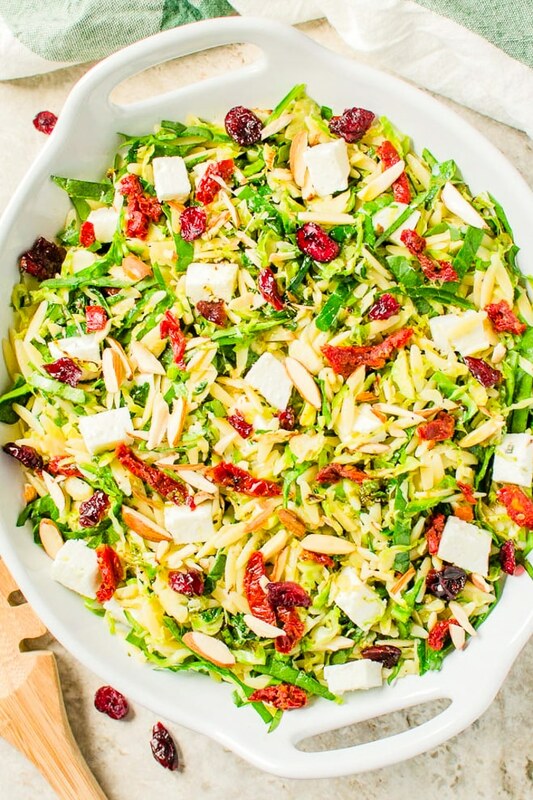 This orzo pasta salad with feta cheese, spinach, and brussels sprouts is an amazingly simple, easy and delicious salad that you can prepare in under 30 mins. A perfect side for party dinner or family meals. I am always looking for ways to incorporate wholesome and nutritious side dishes in our regular diet. And, I make sure that salads form the core of it. When it comes to creating salad recipes, options are plentiful! So, today I am sharing with you a recent creation of mine: Orzo Pasta Salad. I never experimented with the combination of sundried tomatoes and feta cheese. I, therefore, decided to try it with this pasta salad. Much to my surprise, this salad turned out to be absolutely delicious. I never imagined that this combination would go so well together. Moreover, I added a flair for the Fall season with brussels sprouts and dried cranberries to enjoy seasonal foods. I am sure you, your family and your guests are gonna love it. Go ahead, give it a try! You will need less than 30 minutes and very simple ingredients to make this orzo salad. 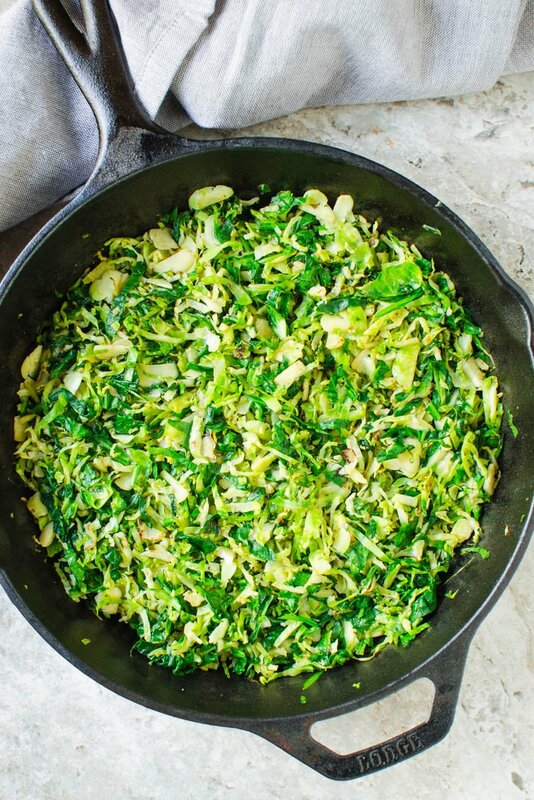 Cut and cook fresh brussels sprouts and spinach for a few minutes until the raw taste disappears. Then in a large mixing bowl mix these veggies with cooked orzo pasta, sundried tomatoes, and feta cheese. For the dressing combine olive oil with some lemon juice, salt, and pepper and generously add to the salad. I also use finely chopped fresh basil leaves in the dressing to further enhance the taste. 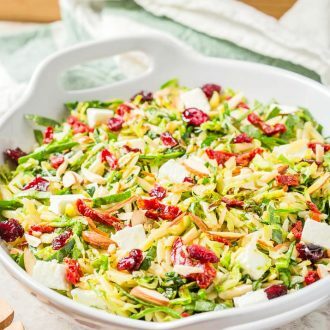 To give this orzo spinach salad a festive touch, garnish with some dried cranberries and chopped almonds for added crunch. 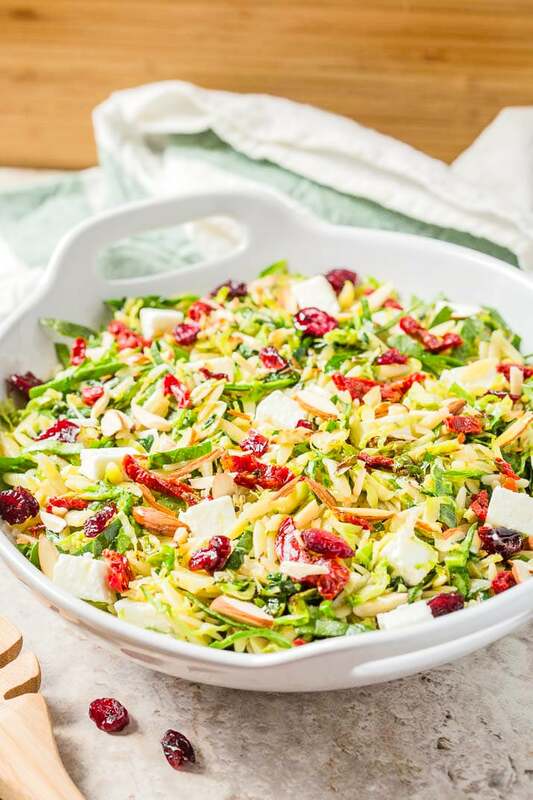 This way you can serve this gorgeous salad at the holiday dinner table! To make this salad gluten-free use orzo pasta prepared using gluten-free grains like quinoa, brown rice, corn etc. To make this orzo salad more nutritious and colorful you can also add bell peppers. Cook them in Brussels if you don’t like their raw taste. For added protein serve this salad on the side of roasted chicken or seafood like cooked salmon fillet or this garlic shrimp in tomato sauce. This orzo pasta salad with feta cheese, spinach, and brussels sprouts is an amazingly simple, easy and delicious salad that you can prepare in under 30 mins. You can also add additional spinach to the salad if you prefer. If you are using sun-dried tomatoes in the jar with oil then drain before using. Pin this Orzo Pasta Salad for Later! Orzo salad has always been my go-to potluck dish but I’ve never added spinach. It gives it so much color and bumps up the nutrition. It looks delicious! Such a bright and colourful salad. Looks absolutely delicious! So hello awesome food blog!! First time visitor to your site and LOVE your name and logo. Great recipe, I love orzo pasta and this dish looks amaze. Well anything with feta and spinach is a must….because it is such a delicious combo. 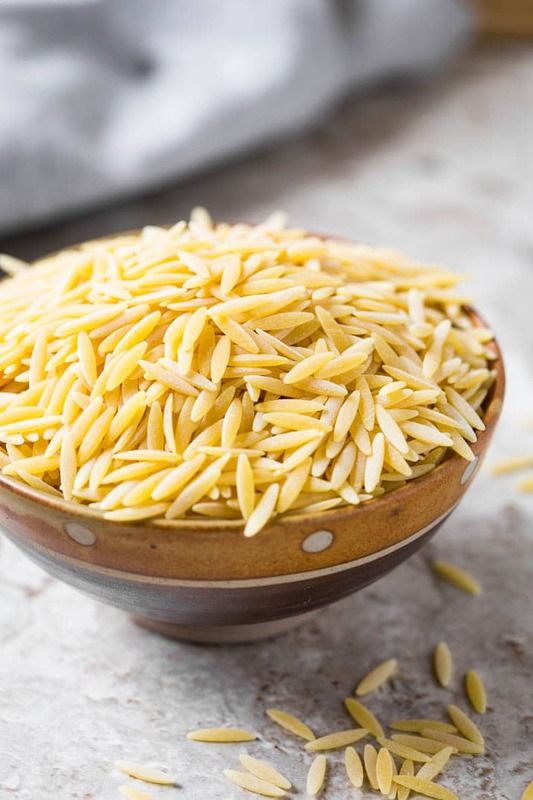 Orzo is an under used ingredient….and YES I do have some. What a great crowd pleasing salad.